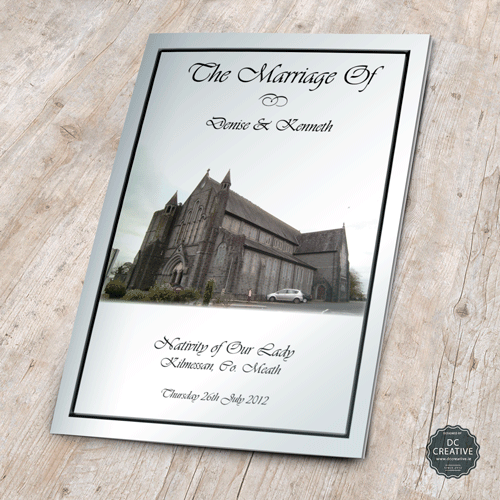 High quality Wedding Mass Booklets at affordable prices, from €69.99. Despite coming down the list of priorities in a wedding, mass booklets (or ceremony booklets for those who don’t go the religious route) are important nonetheless. Not only do they give the bride and groom the opportunity to introduce readers and the wedding party, but they can give guests a flavour of the type of detail that lies ahead for the day. It’s also good to produce something that people can easily hold on to as keepsakes. We believe the A5 style mass booklet is the perfect size for this, and we produce A5 booklets with a 220gsm card cover. 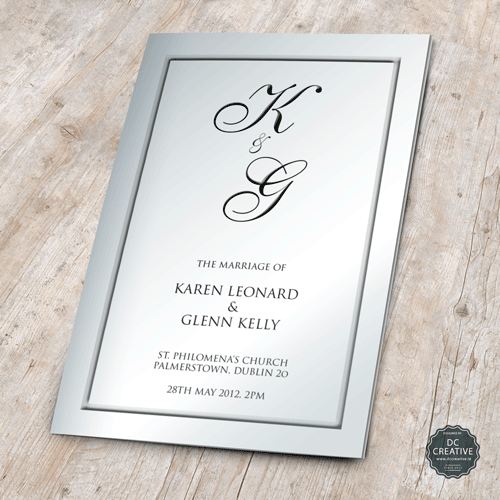 The mass booklet can (and we believe should) be an extension of the design of your wedding day. You can opt for a cover design that will extend through to your table names or favour boxes. You could opt for the colour of your bridesmaid dresses or flowers on the front, for example. Another popular alternative is to have a photo of the church on the cover. 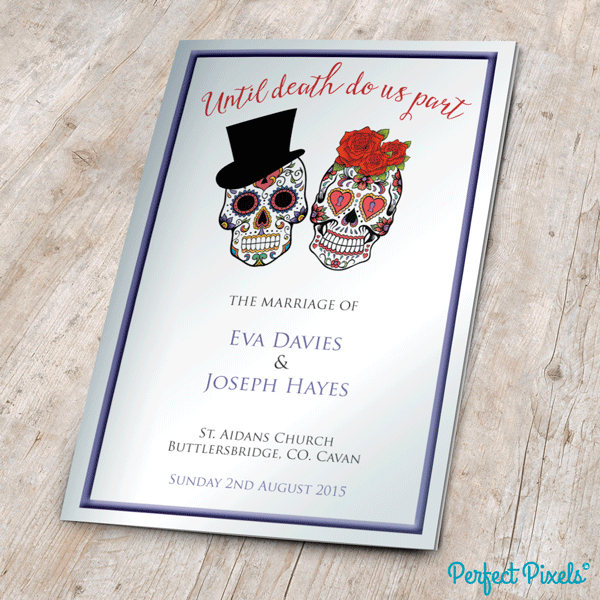 DC Creative offers a range of cover designs, which can come in black and white or colour. We use high quality card for the cover and smooth paper for the inside pages, which are available in either white or ivory. 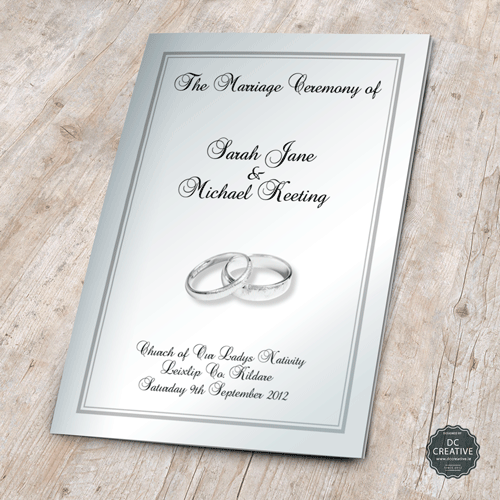 All our wedding mass booklets are folded and stapled to a professional finish. Between waiting for the bride to arrive and for the registry to be signed, guests will have plenty of time to pore over the text of the wedding booklet. 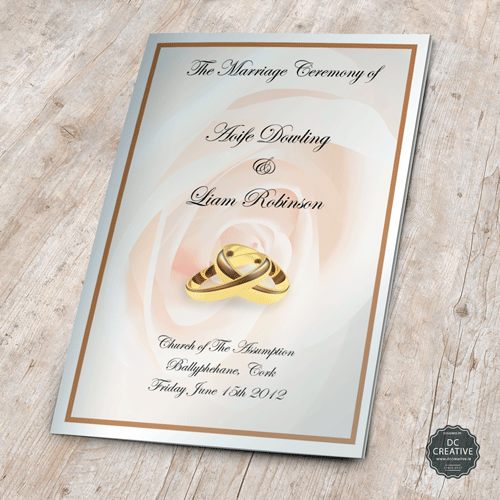 While you should print out the ceremony proceedings. 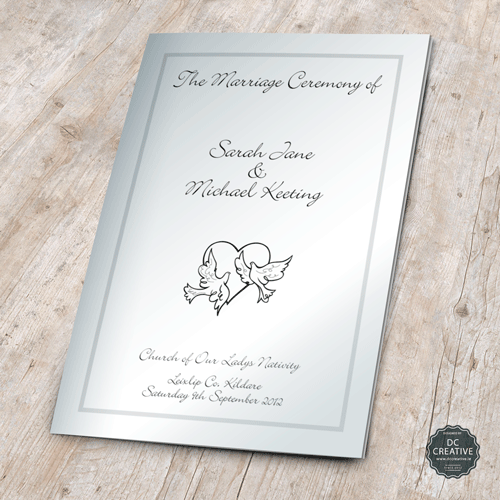 Why not add a quote at the end of the mass booklet, and a simple Google search will help you pick out ones that describe your relationship, memories, or what marriage means to you. They can be fun or romantic; the choice is entirely yours. You could also use a page to thank your guests for sharing in your special day. Some people go a step further and put a poem at the end of the booklet, penning it themselves in some cases! 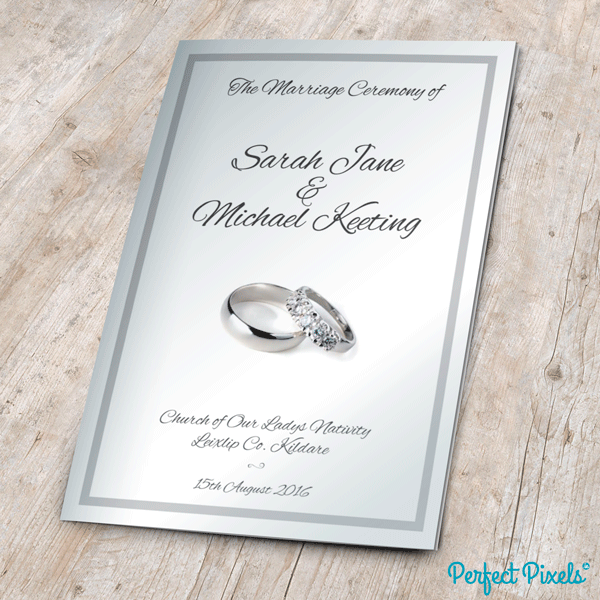 We have the latest wedding booklet template on file, you can request this when placing your order or if you would like us to email you it before ordering no problem just send us a mail and we will forward it on to you. 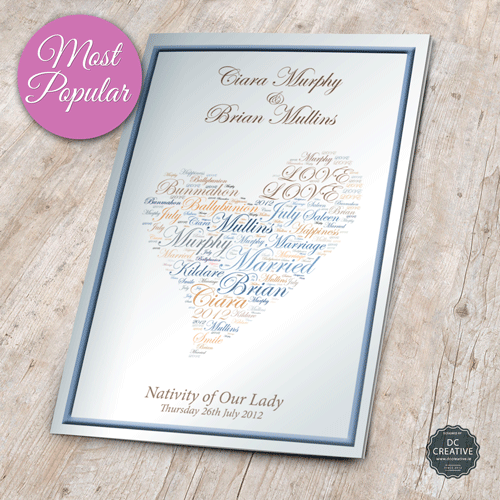 We also have a selection of Irish prayers and a civil ceremony template for you to use if required. Once you have placed your order we normally respond with an email proof within 24 hours. When you are happy with your proof we can post you out a sample for you to sign off on, once this is done we would only need about 5-7 working days to print and deliver. 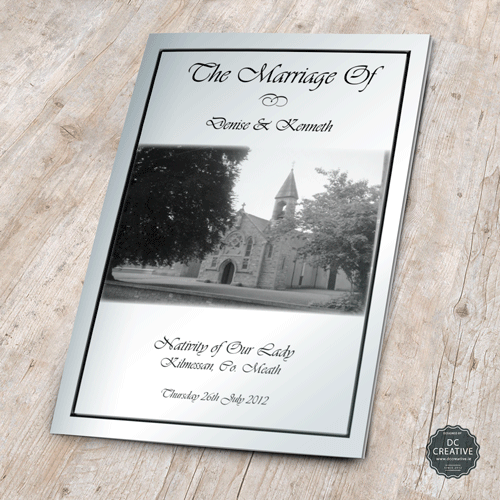 Simpily choose from our mass booklet covers below and enter the details for quantity, names etc. then select 'add to basket' you will then be brought to the checkout page where you place your contact details, please remember to add your telephone number as the courier requires this for delivery. We currently only take payment from Credit Card through PayPal (you don't need to set up an account) which is 100% secure. 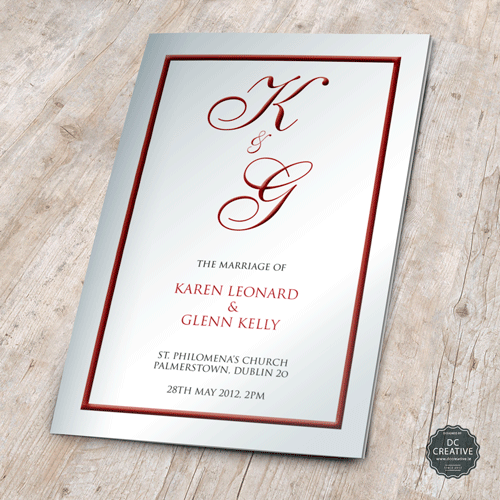 If you’d like some advice on what to include in your wedding mass booklet, give us a call on 01 5329960. We’d be happy to help.